You may have heard the phrase, “happy wife, happy life,” but have you ever heard the phrase, “happy employees, happy company”? It may not have the same ring to it, but that doesn’t mean it’s not true. A good company begins with a solid foundation. And to build this, you have to not only keep your clients happy, but your employees, too. We can’t promise that they’ll be chipper at 7am on a Monday, but by creating a work environment that they enjoy and engage in, you generate more productivity and a better bottom line. Happy employees are not just better employees, but one of the most invaluable components of a company. So how do you build a positive work environment? It all starts with the space. And no one knows space better than the team at the HS Sign Shop. Come see us to redesign your space and craft the perfect environment for your office. Whether that means building a giant neon sign for your conference room or designing a 3D wall display of your company’s motto, we’ll find a way to transform your office and bring your company’s personality to life. With a work environment that showcases your company and motivates your employees, you’ll ensure that your company is strong from the inside out. See some of our custom work. Meetings don’t have to be boring. 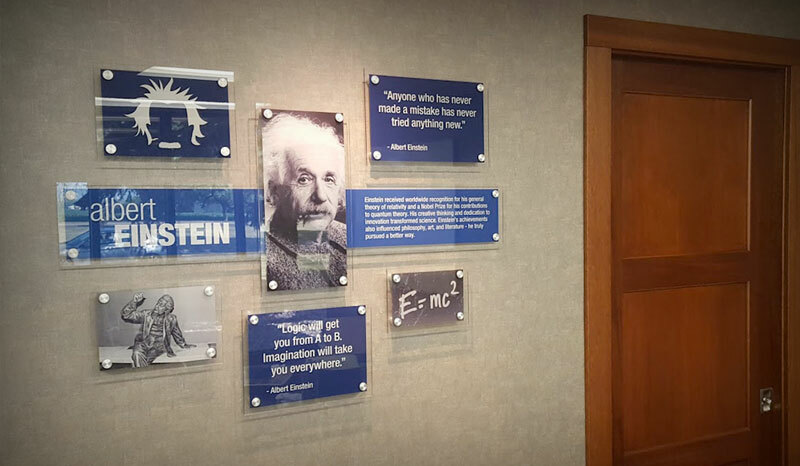 Give your office space some character and your conference room some privacy with one of our custom wall wraps or etched glass displays. The HS Sign Shop can design and install distinctive pieces to set your company apart from the rest. Get the ideas flowing in a space that’s tailored for your office needs. Whether you want a creative space for your employees to brainstorm, a little privacy when you’re making important business decisions, or a place to impress your clients, a wall wrap can take your conference room to the next level and keep you awake when the meeting stretches past the 3-hour mark. These displays work in offices ranging from small startups in the creative industry to big law firms. 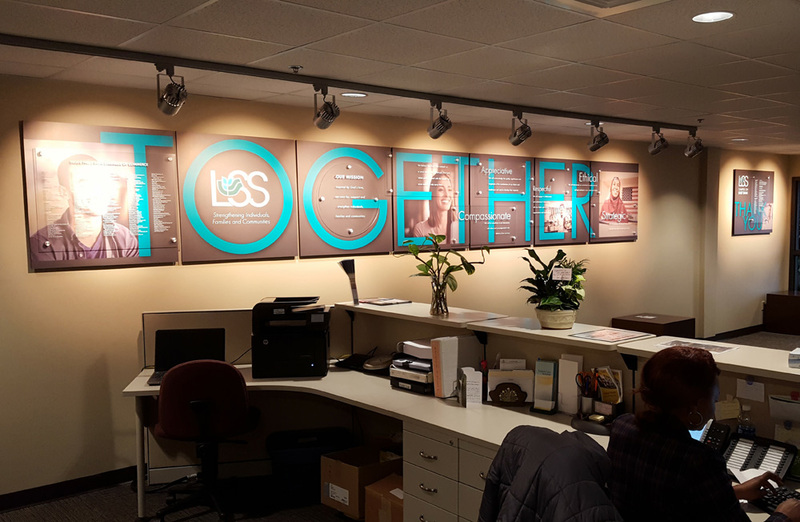 Our graphic designers can draw up a display that instills a sense of motivation, inspires creativity, or dresses up a formal office—whatever suits your specific goals.